Owning a business for almost 5 years makes one very comfortable shamelessly self-promoting one's business. I learned about the "Napa Valley Business of the Week" program on KVON radio from a Facebook post - and....nominated my company, www.BumRiteDiapers.com to be featured. lol. Our local Napa Valley community needs to know that we are here! A cloth diaper resource. A Fellow Mom. A Business Owner. A Green Geek. A Gardener. A Coach. An ECO WARRIOR (that is what a friend recently called me). BumRiteDiapers.com was established in 2009 by a mom (ME!) wanting to promote the use of wash-at-home modern cloth diapers that leave a baby's bum, the Earth and the parent's wallet in perfect harmony! 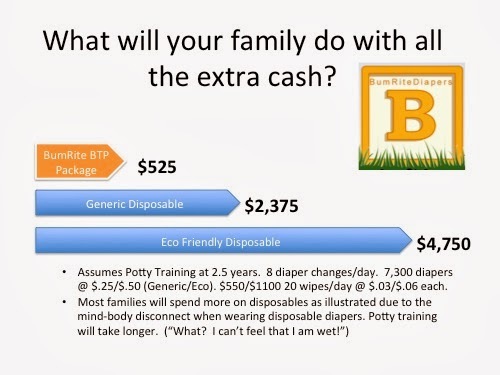 www.BumRiteDiapers.com is part e-commerce, part mom-support. The website, Facebook page and blog aim to educate the public on the benefits of using the new, modern cloth diaper: Easy (to use), Environmentally Friendly, and Economical. BumRiteDiapers.com has shipped cloth diapers all over the USA and World: Dubai, Australia, Iceland, Sweden, Brazil, Argentina, Malaysia, South Africa, to name a few countries....Customers from around the globe are figuring out that cloth is best. And EASY. Now, we need to educate the Napa population. These aren't your grandmother's cloth diapers! For every child in disposable diapers, 6.75 trees will be cut down, 2,850 pints of crude oil will be used in making and transporting the diapers, and 1,075 pounds of plastic will be thrown away. The average family will spend $2000+ on disposable diapers PER CHILD and add 2,000 pounds of human waste laden plastic "poo bombs" to our local landfills that won't biodegrade for 250+ years! Where are we going to put all of that?! Cloth diapers are Better for Baby, Better for the Earth and Better for the Wallet. And what is better than that? Less rash. Babies are changed more often. Cloth allows air to circulate. Cloth and elastic hold in the "soiled matter" better than a flimsy piece of plastic-paper. Cloth is more comfortable for baby. Cloth facilitates a better mind-body connection and, generally, a cloth diapered baby will potty train sooner than a child diapered with disposables. Human waste is flushed down the toilet (where it is treated at our waste-water treatment plants and returned to the eco-system) - not put in our landfills. After writing this - I AM STOKED! I love what I have been doing for almost 5 years. I believe in it. I love the challenge. I love watching skeptical people's faces change when I explain the way it works and they actually see-touch-feel a modern cloth diaper. OF COURSE! Please help to spread the word. Many people have no clue how far we've come in design and textiles. The reasons to use Cloth Diapers are irrefutable. DO IT with pleasure. Have fun with it. With parenthood. It's a Journey.